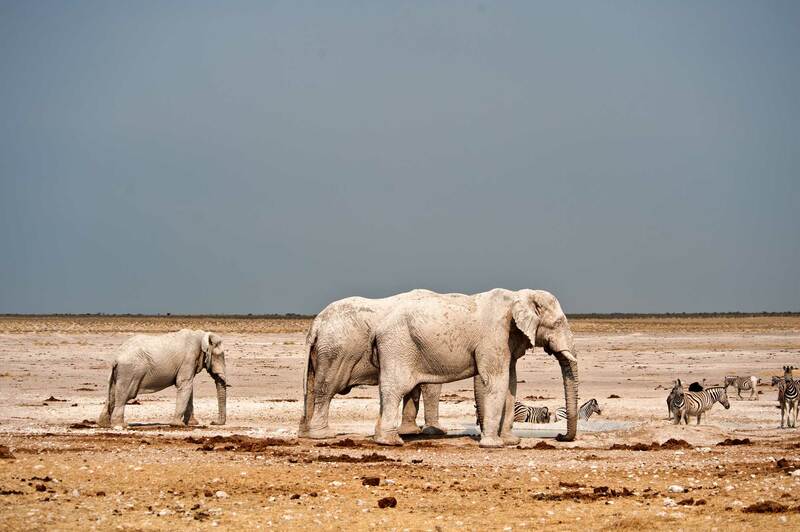 The rainwater of the last season is disappearing at a surprising rate and the slow but steady shift back to the age-old and imprinted permanent water sources of Etosha is about to begin. A chill in the twilight air and a crystal-clear view of the evening star herald the dawn of a new season in Etosha. The rains have gone but the legacy of grass remains; the desiccating heat is a distant, almost forgotten prospect and the white dust remains settled and firm underfoot. It is the start of winter in a place most noted for its summer; the start of a period where yellowing grass dominates and shadowy movements hide an artificial calm. T he winter season witnesses the now six-month-old springbok lambs exuberant in the abundance of food available to them. Their rapidly growing bodies and minds prepare them for survival in a harsh paradise that appears for now to be just a little less harsh. The larger herbivores likewise graze and browse vast areas not usually available to them in summer, and the largest of all wrap their trunks around succulent mopane branches. Predators too enjoy the abundance, and waterholes are no longer their hunting grounds – the whole of Etosha is their grass-covered pantry. The lion’s golden shadow falls on yellow grass, but there is an underlying urgency to the calm heralded by winter. The rainwater of the last season is disappearing at a surprising rate and the slow but steady shift back to the age-old and imprinted permanent water sources of Etosha is about to begin. The southern edge of the Etosha Pan is the narrow band of abundant natural and perennial springs. Some of these are blessed with sweet water, while others tend to be brack – but almost all are used by wildlife at certain times of the year. With the pools of fresh rainwater now drying, there is an almost choreographed movement of herds back towards this now vacant habitat along the southern edge. Long lines of striped zebra appear to be the first returnees, providing a wildlife spectacle against the vast, hollow horizon of the pan. The sound of the zebra herds calling, kicking and fighting is as impressive as the sight of the herds themselves, and you wonder where these vast numbers of animals have been for the past few months. Wildebeest and other antelope follow the zebra, and so too do the predators. The edge of the pan starts living again, but there is one conspicuous absence: elephants. In the early phases of the rainy season – with distant massing of clouds and occasional flashes of lightening in the night skies – the elephants respond to this distant rumbling, and are the first to leave the usual summer ranges. They move to the areas of the park, and indeed even those outside the park, where huge pools form and strong flowing rivers flood the savannah, pan and woodlands. In this watery paradise the elephants remain until well into the winter months. Sightings of elephants during this time are few. To fully understand this movement, you need to view it from an aircraft. 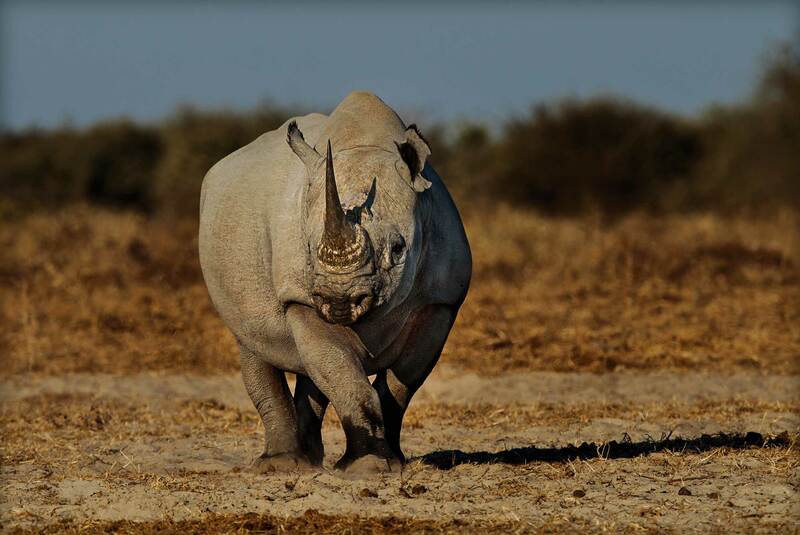 Yet, as the winter progresses, even these giants of Etosha begin to respond like the rest of the wildlife. Huge animals need huge water and as the summer pools shrink and turn into mud holes, the elephants, now usually covered in dark brown and black mud, set their sights on returning to their dry-season waterholes, where they will again regain their characteristic white coats. It’s a wonder to witness how hundreds of elephants, covering hundreds of square kilometres, can respond as one and move as a unit. It is now known that they use infrasonic communication to achieve this. 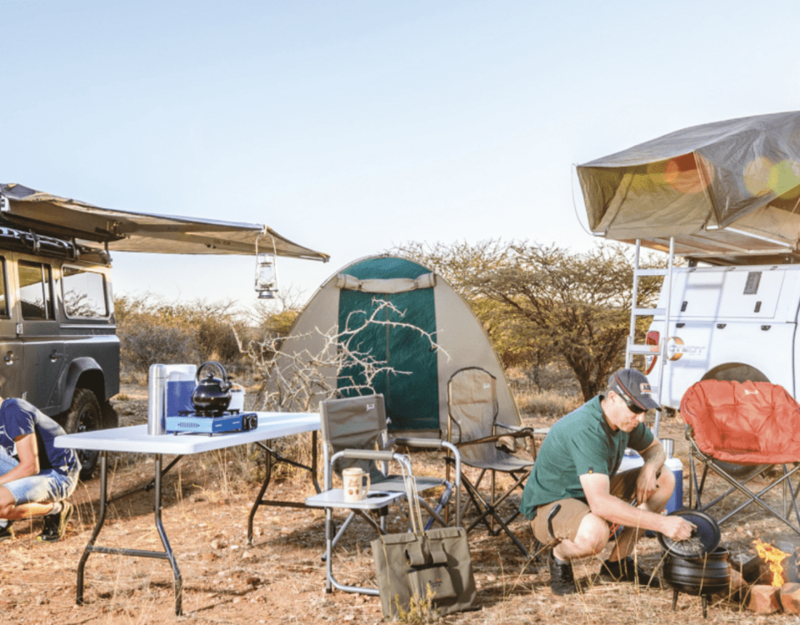 Calling at certain times of the day when a strong inversion layer hangs over Etosha, usually early morning and late afternoon, the low-frequency calls that we cannot even hear, bounce off these strong inversion layers and travel hundreds of square kilometres. The elephants respond to this secret and silent language, uniting in their late-winter trek back across the yellow plains. With the yellow grass all but hiding springbok herds and rubbing against the knees of the returning elephants, it strikes you at this time of year just how good the condition of the wildlife is. 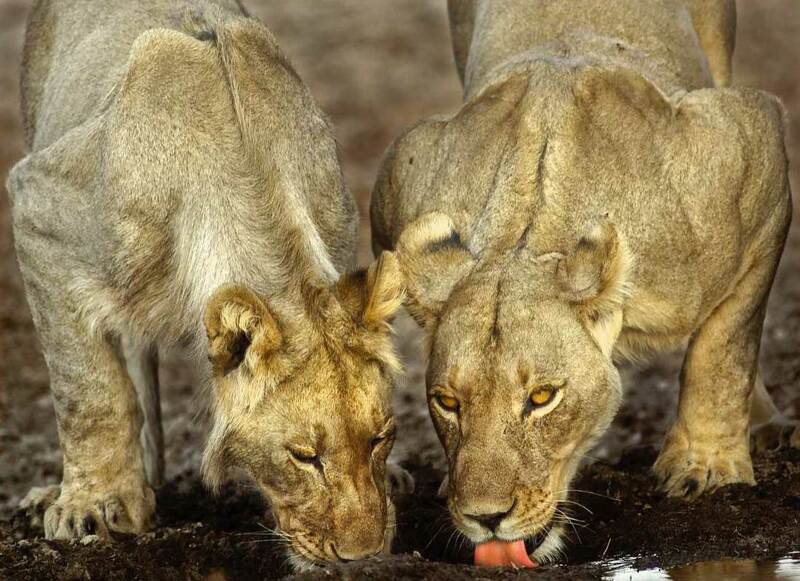 A season of abundance has graced Etosha and the yellowing and drying grass and vegetation has its highest nutritional value, particularly protein, at this time. The biofuel of the land is at its peak. 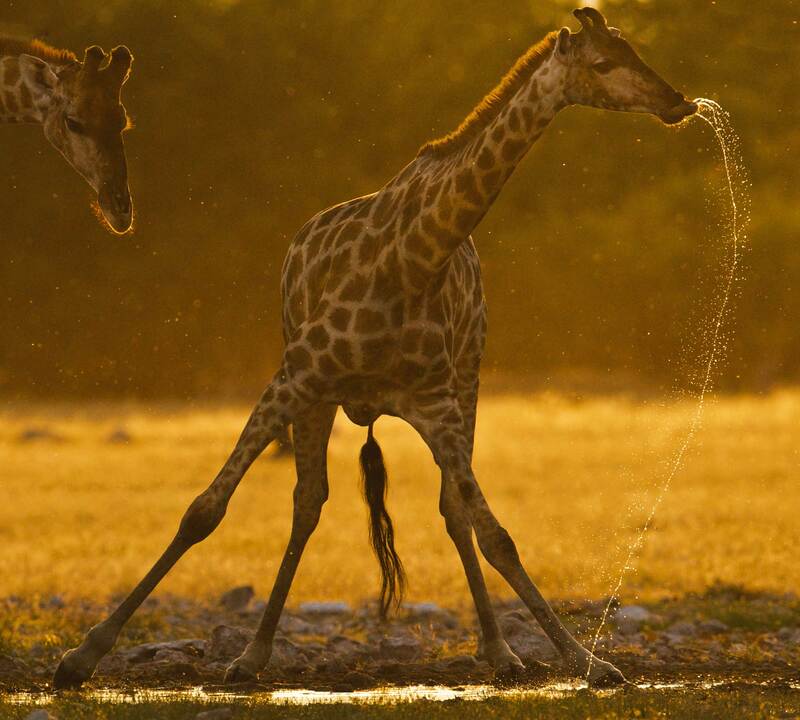 Water and time created this and now it lies at the mercy of another driving force of Etosha: fire. It is a small stirring in the grass and perhaps just a hint of an east wind that announce that winter may be waning. A small cumulus cloud breaks the endless horizon and the crisp skies become curiously opaque. Waterholes quench the thirst of a seemingly hourly expanding wildlife cohort, yet the white dust remains firm underfoot; for the time being. By late afternoon some clouds have grouped and before dissipating after sunset, they discharge small streaks of light and power. This ‘dry lightening’ is as characteristic of the season as the returning herd, and so is its consequence. Resultant fires can be small and self contained, or all consuming and vast. Driven by wind and fuelled the dry vegetation, the yellow season gives up its last offering and fire transforms the habitat as it has done for millennia. The elephants reach the waterholes in a regal parade-like way. Still black from their winter escape, they appear as shimmering masses that gradually transform into the shapes we’ve been waiting for all season. If you look carefully at the silent footfalls of the approaching giants you might just see the first faint puffs of white dust. Etosha Pan is one of the most important inland breeding sites for flamingoes. For the birds it is also one of the most unpredictable sites. Here catastrophic failure is peppered with occasional success. The flamingoes have a few regular and repeat-use nesting sites on the vast pan, and conditions and timing have to combine in a perfect way for there to be a successful breeding episode. Most nesting sites are situated along the ancient prehistoric watercourse that runs east-west across the pan. The birds arrive in Etosha shortly after the first rains, and if there is enough water surrounding the sites, they start courting and preparing the nests and laying. This is a critical period, as follow-up rain is essential to maintain water around the nesting sites. If not, the nests are abandoned and eggs are consumed by scavengers. If the water persists and eggs hatch, it becomes even more critical that the water in the pan persists, either through local rain or from pan inflow. If at this stage the water starts to fail, the flamingo chicks form massive groups or crèches. With the adults they attempt, like a marching army, to keep up with the retreating water. If they fail, tens of thousands of chicks simply die on the pan. For success there has to be enough resupplied water to continuously span the period from hatching to fledging, and if the water fails at any stage, so does the breeding. Failure is far more common than success, but when it all comes together, as it did last year, the result is phenomenal. 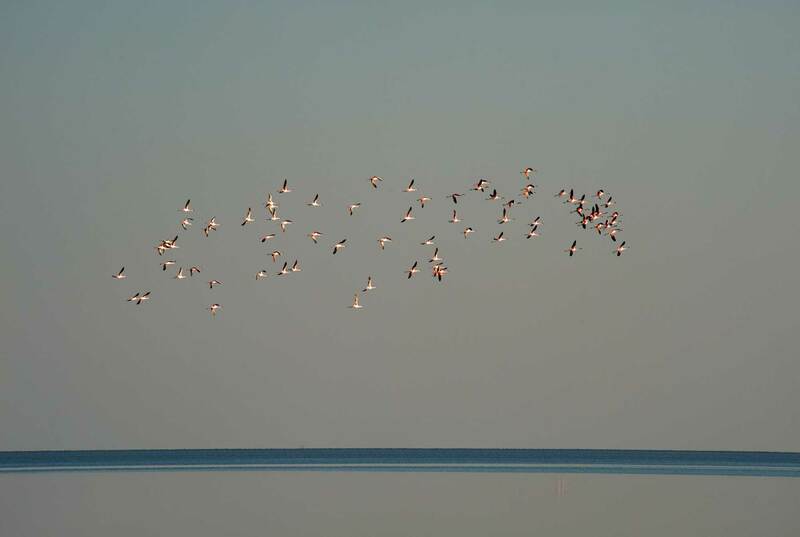 It is possible for as many as one million birds to grace Etosha Pan in good years, and even more possible and likely for many thousands of chicks to perish on a pan where the fickle finger of fate plays a hard and unforgiving game. This article was first published in the Winter 2012 issue of Travel News Namibia.